Join Frodo and the Fellowship on the perilous adventure across Middle Earth, and use your skill and fortune to guide you! I’m not a huge fan of Reiner Knizia’s games as a rule—they always seem a bit too dry to me—but this game kicked off the cooperative game genre and is considered a classic, so I felt I had to add this new, more compact FFG ‘Silver Line’ edition to my collection. 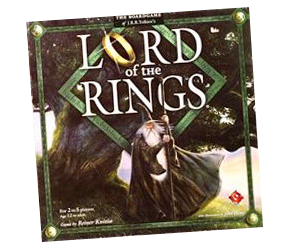 Reiner Knizia’s Lord of the Rings game, first released in 2000, and the various expansions that have followed, were quite revolutionary for their time. On stunning boards illustrated by the well-known artist John Howe, players must work together to ‘defeat the game’; each playing a hobbit who moves through important scenes from The Lord of the Rings, to eventually reach Mordor and destroy the Ring. As in many games of this type, ‘bad’ events are usually triggered by card play, and Sauron moves ever closer to the hobbits on the Corruption track as the game progresses. It’s an atmospheric, tense and exciting game that has stood the test of time and really immerses you in the world of the books.